As Macklemore once said, “One man’s trash, that’s another man’s come-up.” Many others have jumped on the thrift shop bandwagon with Macklemore. Rather than spending their time and money shopping in a mall, they’re taking their business to thrift stores where they can discover unique, secondhand wardrobes while becoming more eco-friendly consumers. Before purchasing a brand new shirt, take into consideration its environmental footprint. For example, manufacturing a single cotton t-shirt requires an enormous amount of water, not to mention the carbon emissions associated with transporting that new shirt around the world, only to inevitably end up in a landfill. Dyeing clothes can also be an incredibly environmentally taxing process. By keeping our consumption of newly manufactured clothing to a minimum, we can help reduce some of these environmental impacts. Thrift store clothing typically sells for a fraction of the retail price. As much as I would love to buy a new pair of pre-ripped jeans for $80, I would be foolish to do so. Back in the day when I was young and naïve, the thought of wearing a “cooler” outfit seemed more important than the environment or my depleting bank account. Now that I am older and somewhat wiser, I am more conscious of my purchases. Especially considering I am a college student that has studied abroad and currently has an unpaid internship, it’s important to be more aware of how I’m spending my money. Who says wearing secondhand clothing isn’t cool? Along with Macklemore, other celebrities like Zooey Deschanel and Julia Roberts shop at thrift stores. Some of the most interesting and creative outfits I’ve worn are made from items I got from thrift stores and secondhand stores. I’d rather be wearing something different anyway, instead of the same shirt as the rest of the girls at school. At TerraCycle, the Design Team even occasionally makes upcycled clothes out of recycled or upcycled materials, which is pretty incredible. 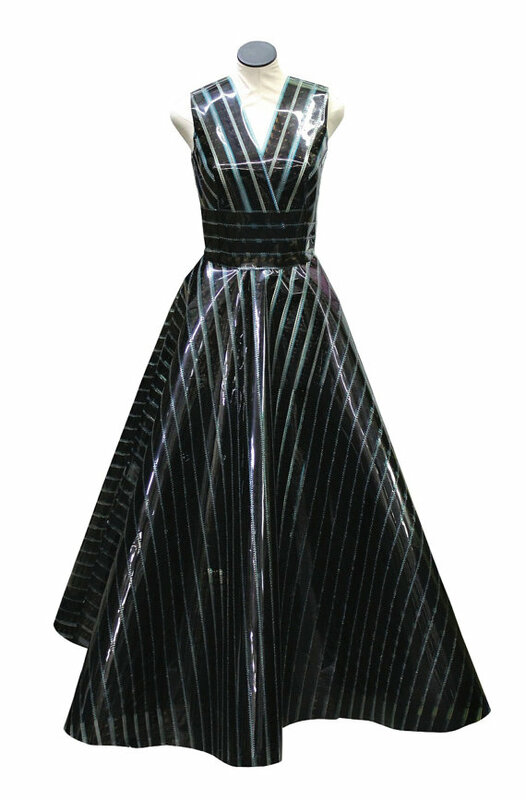 My mind was blown when I saw this dress made out of old movie filmstrips! Excellent points, eco or green fashion is a much needed growing change to develop a sustainable society and it can be promoted by everyday people like you and me, not just stars and designers. Agreed! Thanks for the support, fashionistaaussie1986!